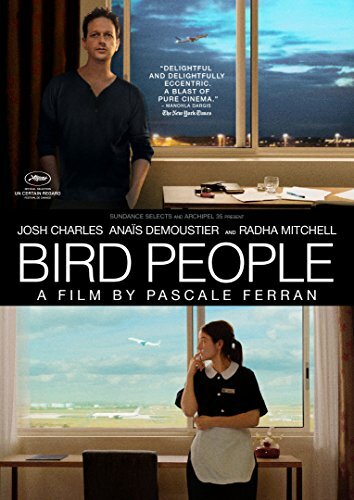 In an airport hotel on the outskirts of Paris, a Silicon Valley engineer (Josh Charles) abruptly quits his job, breaks up with his wife, and isolates himself in his room. But as fate draws him and a young French maid (Anais Demoustier) together, he may just discover the unexpected shakeup his life so desperately needed. In an airport hotel on the outskirts of Paris, a Silicon Valley engineer (Josh Charles, The Good Wife) abruptly quits his job, breaks up with his wife, and isolates himself in his room. But as fate draws him and a young French maid (Anais Demoustier, Therese) together, he may just discover the unexpected shakeup his life so desperately needed. Cesar Award-winning director Pascale Ferrans (Lady Chatterley) dark-tinged fairy-tale Bird People is a rich, beguiling, and utterly astonishing story of two lives in flux brought together in the most unexpected of ways. A leader in the independent film industry, IFC Entertainment consists of multiple brands devoted to bringing the best of specialty films to the largest possible audience: IFC Films, Festival Direct, IFC Productions, and the IFC Center. IFC Films is a leading distributor of independent film. Its unique day and date distribution model, 'IFC In Theaters,' makes independent films available to a national audience by releasing them simultaneously in theaters as well as on cable's On Demand platform and through Pay-Per-View, reaching 50 million homes. 'IFC Festival Direct' features a wide selection of titles acquired from major international film festivals and offers them exclusively through Video on Demand. IFC Productions is a feature film production company that provides financing for select independent film projects. IFC Center is a three-screen, state-of-the-art cinema with luxurious seating and HD digital and 35mm projection that shows art-house films in the heart of New York's Greenwich Village. IFC Entertainment's companies are subsidiaries of Rainbow Media Holdings LLC.